Carol Homersham and Joan Proctor of Barrie, Ontario were the most stunning women at breakfast in their custom-made hats. It was Homersham’s first visit to a racetrack, but she looked like a Kentucky Oaks fashionista in her black mesh chapeau with a big bow. Homersham’s hat went in different directions; its flat oval top slanted left and the brim to the right. Proctor’s was an odd green – the kind you see painted on hospital walls or in good camouflage, and subtle Navy – almost black, but beautiful nonetheless, with swirls of netting that cascaded from the crown. The two women, accompanied by two gentlemen, escaped a group of four other friends who decided to sleep in. Home away from Barrie for these eight visitors from Canada is a late 1800s farmhouse in Argyle, New York. 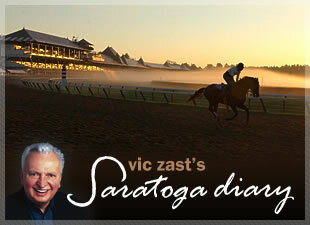 “I think I found heaven,” said Homersham, when asked how she was enjoying the Saratoga experience. There were other women at breakfast wearing hats, but they were Trunketts. That’s the name by which 14 friends who model clothing for Saratoga Trunk, the 14-year-old Saratoga Springs business that USA Today rated America’s number one millinery, call themselves. Trunketts range in age from 24 to 68. Hats from Saratoga Trunk retail from $300 to $1800. The light brown, lampshade-styled hat with dark brown peacock feathers woven into horsehair, which Joanne Finn, a close friend of Saratoga Trunk’s owner Natalie Sillery chose to wear, was priced at over $400. Each Friday morning, on the Porch of the racecourse, Saratoga Trunk has a fashion show to launch the weekend. Finn said, “When you put on a hat you complete the outfit.” It’s funny, then, that not many hats were found in the clubhouse or grandstand in the afternoon. By one silly man’s count, there were only 23 women wearing fancy hats, 1488 wearing ball caps, 21 in babushkas, and one that had shaved her head bald. It was yet one more day for umbrellas, not hats. NYRA cancelled the races after the second was run. A 30-minute blast of lightning, hail and torrential rain washed out the far turn of the main track. Maintenance crews determined it would take more than an hour to fix things. The crowd left the grounds reluctantly under perfectly sunny skies. Die-hard fans stayed for simulcasting. Hat-wearer Meg Bedell of Oceanport, New Jersey – yes, that Oceanport, New Jersey, where Monmouth Park is – was one of them. She asked rhetorically, “I came to Saratoga and I’m betting on Monmouth?” Bedell’s sister, Rosemary Dougherty, echoed the sentiment. “I’m really bummed,” she said. Many fans wondered why NYRA was so quick to pull the plug on live racing. Cynics immediately leaped to the conclusion that the jockeys were leveraging a walkout as part of a labor negotiation. “They’ve conducted twilight racing on Fridays before. Didn’t they think the fans would wait around?” a white cap murmured.